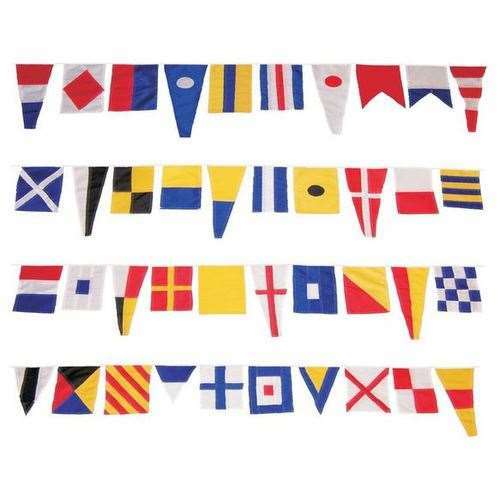 Nautical Signal Flags are used by ships to send messages. Each flag represents a letter, number or code. 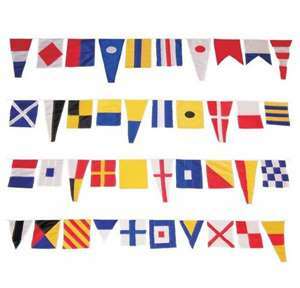 Use our Nautical Signal Flag Banner to add nautical flare to a boys bedroom, a patio, pool area, etc. Made with bold weather and fade resistant Nylon fabric. Rectangular flags are 6 inch x 9 inch. Pennant Flags are 6 inch x 14 inch and 6 inch x 9 inch. Nylon cord is over 40 feet long with 36 inch ties on both ends. Not regulation size - intended for decoration only.